Sometimes severe lessons are learned from the very heavy prices paid. You would say goodness if those heavy prices were not paid and those lessons were not extracted. Perhaps that situation is valid for the Syrian crisis the most that has left very painful lessons. Just like the other closed communities the Arab Spring closely affected Syria too. As soon as Syrian people started their rebellion after decades of the dead of winter against the oppressive regime, what they had to come across was not the effort to understand what they wanted but the fundamental reaction of a dictatorial regime, a crushing campaign. The Syrian civil war completely deepened because of Iranian participation in the war with its soldiers, Russian support for Assad regime and lack of a solution perspective of the Western countries. Hundreds of thousands of people died/killed. Millions of people had to leave their country. The EU countries almost remained unconcerned with the Syrian crisis and refugees until they leaned on their own doors. The reactions shown in the West were shameful in the name of mankind following the arrival of refugees on their borders. Most of the EU countries who always used to direct their criticism towards the other countries regarding several issues like puralism, living together, human rights, equality, freedom and the right to live, failed in their first test on these values. They ignored the fact that refugees were also human beings who deserve these values. The only worry/value of the EU countries was to stop refugees from coming to their countries. After this point they were not lonely, helpless and miserable babies like Baby Aylan who washed ashore but actually the EU values themselves. Regarding the refugees suppose for a moment that Jordan, Lebanon and Turkey had closed their doors to mankind/refugees in line with the policy exercised by the EU countries. In this situation millions of refugees were going to force the doors of the EU countries. A small number of refugees who succeeded to arrive in the EU caused inhumane reactions and if rising fascism and nazism raids are taken into account, certainly the human and values crisis of Europe was going to deepen even further. Despite the fact that Turkey has been hosting 3.5 million Syrians on its territories alone and it has declared that it will exercise an open door policy regarding Syria, the ruling party is increasing its votes. The number of refugees that Turkey’s one city Kilis has been hosting alone is bigger than the number of refugees accepted by many EU countries. The answer of Kilis Governor was very historical when an EU country said that it could accept 130 refugees: “That country should not bother, I will look after that many refugees at my home”. The political parties in Europe are competing with each other to increase their votes through their policies against immigrants, refugees, foreigners and Islam. The political party promising “zero refugee” emerged as the number one party in Austrian general election. Fascist and Nazist parties are on the rise in many European countries. They are forming coalitions in some countries. Center right and left parties are being radicalized to prevent further surge of the ultra-right. Definitely Europe’s crisis comprises very serious risks for the mankind while it has been gradually turning into an inward looking society and darkening its future. Today if moderate democratic parties can come to power in Europe, this is because of the superhuman efforts of Turkey and regional countries regarding the refugees. The absence of absolutely any Syrian refugee in Iran and the Gulf countries is surely a major subject to be discussed. Despite defeating Daesh, it is remarkable that the policies of the global actors are meant for virtually deepening the Syrian crisis rather than solving it at the point reached so far. Unfortunately this situation is not peculiar to Syria. In Afghanistan, Iraq, Libya and Syria, no stability has been established in the countries where “International Coalition” has interfered. Conversely these countries are becoming more uninhabitable because of death, tears and huge migrations. The regional countries have to/will have to bear the whole cost of this situation. For this very reason, in this kind of crises regional coalitions must be sought for a solution rather than international coalitions who do not have to bear any cost at all. Despite the defeat of Daesh and tendency of stopping the civil war in Syria, continued supply of thousands of trailer loads of arms to PYD/YPG by the United States and its statements to transform YPG into a “border force” are rightly being strongly reacted by Turkey and regional countries. PKK and PYD is a terrorist organization that has killed tens of thousands of people in Turkey and regional countries. How Bin Ladin’s Al Qaida establishing a “border force” along the US border would be perceived in the United States, the same way it has been perceived in Turkey and regional countries. Turkey has justifiably started the Operation Olive Branch for its own defence, regional stability, to liberate people from the captivity of this terrorist organization and to stop a new migration influx that could come to it. This legitimate operation of Turkey is insistently being distorted by some power centers. One of the most reasons for the Operation Olive Branch is to preserve Syrian territorial integrity. Because the US backed PYD/YPG terrorist organization is gradually settling in an area starting from Iraq to the Mediterranean and dividing Syria. 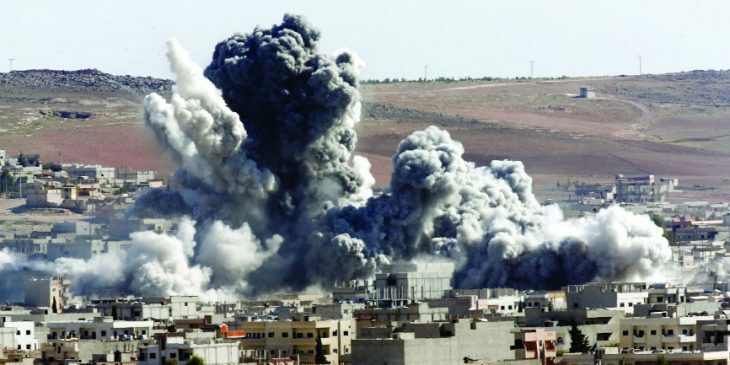 Turkey’s operation against terrorism is being tried to be shown as if it is against the Kurds. How an operation against Osama bin Ladin is not against the Arabs, the same way is Turkey’s operation. Turkey is not permitting a terrorist organization to establish a terrorist region on its borders that has been generating terror for tens of years. Besides, the people who live in Turkey and the region are very well aware of the fact that PKK with its name in Syria as PYD/YPG has perpetrated its most murderous attacks on the Kurds who do not support it. PYD/YPG has been exercising ethnic cleansing of the Kurdish, Arab, Turkomen and Non-Muslim groups who do not support it in the region under its control. Millions of people who have fled from here have taken a refuge in Turkey and regional countries. In this situation it is necessary to ask why the US backed terrorist organization does not allow the real residents of the region to return to their homes. Turkey’s operation is also opening the door for the returning of all ethnic and religious elements to their country by clearing the region of terrorism. Like all wars definitely this war will also come to an end. When we look back the important thing is, which values to be left for the future generations we could protect and save in this war and the other wars like it, eventhough we have lost most of them.